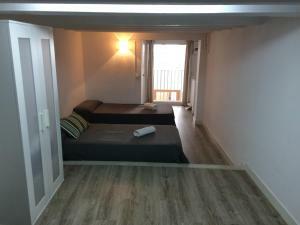 Situated in central Barcelona, 350 metres from Girona Metro Station, Hostal Colkida features a furnished terrace overlooking a private courtyard. It offers 24-hour reception and rooms with air conditioning and heating. You will find shops and restaurants within 100 metres of the guest house. Paseo de Gracia Boulevard, with its exclusive boutiques and Gaudi’s buildings, is a 5-minute walk away. Sagrada Familia Cathedral is 1.6 km from the property and Barceloneta Beach can be reached in 25 minutes by metro. When booking more than 7 rooms, different policies and additional supplements may apply. Please inform Hostal Colkida in advance of your expected arrival time. You can use the Special Requests box when booking, or contact the property directly with the contact details provided in your confirmation. Rate: € 38.33 ... € 105.00; select dates below to get current rates. This room has air conditioning and heating. It is equipped with a flat-screen TV and wardrobe. There is 1 double and 1 single bed, as well as a private bathroom with a shower and hairdryer. Towels and bed linen are also provided. This room has air conditioning, heating, a flat-screen TV and a wardrobe. 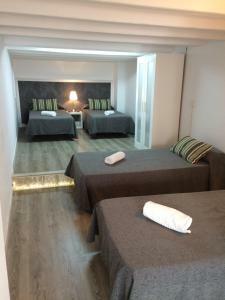 There is 1 double and 2 single beds, as well as a private bathroom with a shower and hairdryer. Towels and bed linen are also provided. Rate: € 37.00 ... € 82.00; select dates below to get current rates. Rate: € 45.82 ... € 97.80; select dates below to get current rates. Offering views of the property's terrace or city views, this air-conditioned and heated room comes with a flat-screen TV and a wardrobe. 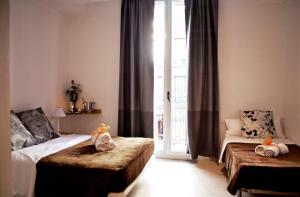 It is composed of 1 double bedroom and a private bathroom with a shower and hairdryer. Bed linen and towels are provided. This room has access to a shared fully equipped kitchen; and has a mini-fridge inside the room. Rate: € 58.77 ... € 71.63; select dates below to get current rates. This air-conditioned and heated room comes with a flat-screen TV and a wardrobe. It is composed of 1 double bed and 1 single bed; and a private bathroom with a shower and hairdryer. Bed linen and towels are provided. This room has access to a shared fully equipped kitchen; and has a mini-fridge inside the room. This air-conditioned and heated room comes with a flat-screen TV and a wardrobe. It is composed of 1 double bed and 2 single beds; and a private bathroom with a shower and hairdryer. Bed linen and towels are provided. This room has access to a shared fully equipped kitchen; and has a mini-fridge inside the room.